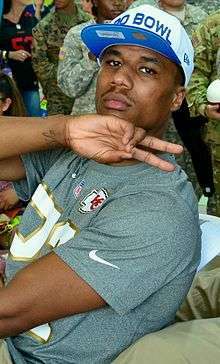 Marcus Peters (born January 9, 1993) is an American football cornerback for the Kansas City Chiefs of the National Football League (NFL). He was drafted by the Chiefs in the first round of the 2015 NFL draft. He played college football at Washington. Peters attended McClymonds High School in Oakland, California, where he played football and ran track. He played as a cornerback for coach Curtis McCauley. As a senior, he notched seven interceptions and scored six touchdowns on kick or punt returns. He also played wide receiver and kicker. He was named the MVP of the Oakland Athletic League, as he led the Warriors to a 12-0 record, the school's first-ever perfect season. In track & field, Peters competed as a sprinter. As a senior, he won the 100 meters (10.87 s) and 200 meters (22.91 s) events at the Oakland Athletic League Championships. Peters was a three star recruit by Rivals.com and the 30th best cornerback in his class. He committed to play college football at the University of Washington in January 2011. Peters was selected by the Kansas City Chiefs with the 18th overall selection in the 2015 NFL draft on April 30, 2015. On September 13, 2015, in the regular season opening game against the Houston Texans, Peters intercepted Brian Hoyer in his first career snap. In the second quarter of his second game, he picked off Peyton Manning and returned it 55 yards for a touchdown. Peters would record his 3rd interception of the year by picking off Minnesota Vikings quarterback Teddy Bridgewater in Week 6. In Week 10, Peters got his 4th interception of the year by picking off Peyton Manning for the second time in his rookie year. He later picked off Raiders quarterback Derek Carr, in front of his family in his hometown of Oakland, California. Against the Baltimore Ravens, he had two interceptions, including a pick six, bringing his season total to 7. During his rookie season in 2015, Peters started all 16 games making 8 interceptions, which was tied with Cincinnati Bengals safety Reggie Nelson for most in the league, with 2 interceptions returned for touchdowns, 1 forced fumble, and 26 passes defended on 60 total tackles. Peters received multiple honors for his rookie season. He was one of three rookies named to the 2016 Pro Bowl. He also was named 2nd Team All-Pro. He won several awards including AFC Defensive Rookie of month for December and AP Defensive Rookie of the Year, he also was a finalist for the Pepsi Rookie of the Year award. Peters is the 4th Chiefs player to win defensive rookie of the year joining Dale Carter, Bill Maas, and Pro Football Hall of Famer Derrick Thomas. ↑ "Washington Huskies' Marcus Peters dismissed from team". ESPN.com. November 6, 2014.